This was done simply to discover if I could do it. I went though a stage where my goal was to remove as much material from an egg shell as possible while still retaining the shape and image of the egg. More views of this minimalist marvel here; links to more views of the scrimshaw egg shell, and to other contra-seasonal sensations here. 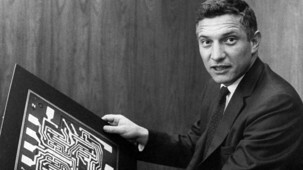 Noyce made his breakthrough at Fairchild Semiconductor, of which he was a founding member. He went on to co-found Intel, then to serve as the unofficial “Mayor of Silicon Valley,” a mentor to scores to tech entrepreneurs– including Steve Jobs.